April 9, 1993 was the end of an era for New Haven hockey when the New Haven Senators played their final game at the New Haven Coliseum. The Senators single season in the Elm City was one that’s often forgotten. When the Ottawa Senators bought the Night Hawks in 1992 they dropped the Night Hawks namesake, which was blasphemous among fans who supported the team for 20 years. The diehard Night Hawks’ fans despised the change so much that they decided not to attend Senator’s games. After a terrible lone season the Senators left and with them professional hockey in New Haven. of the city. The Beast colors were derived from their parent clubs, the Hurricanes and Panthers, and soon Beastmania swept the city. The games were soon packed and hockey was once again the pulse of the city. Heck the New Haven green even had Beast paw prints on the sidewalk! The new minor league club was one of the more talented rosters in the AHL as they went 71-68-14 in their tenure while also added a dimension the Constitution state. Now with two minor league teams in Hartford and New Haven it created a bitter rivalry between the two cities, a new dynamic that Connecticut had never experienced. While the Sound Tigers and Whale continue a similar rivalry today, Bridgeport vs. Hartford was nothing compared to New Haven vs. Hartford. We’ve battled it out for who should have been the capital and which city was the best in the state. The rivalry between the Wolf Pack and Beast went further than geography, but old hockey wounds. First, the Beast were the last piece of the Hartford Whalers to remain in the state which stirred up frustration since their was no NHL team in the state while also having people support the Beast since they were part of the former Whalers. Another reason this rivalry was so bitter was because of the Wolf Pack affiliation with the hated Rangers. Despite being told over and over again that the new minor league team would look nothing like the Rangers, it was funny how the Wolf Pack had the same colors and uniforms the Rangers had. This rivalry had everything from geography, passionate fans, and history. Throughout their run the Beast had great rivalries with Hartford, Springfield, and Providence and provided the city with the with the high level of hockey the city had missed for years. Sadly the Beast, much like their predecessors would not last. By the end of 1999 the Beast would end their run in New haven as they left the Coliseum. There were many reasons the Beast left, but the primary reason was the declining Coliseum that desperately needed a makeover. Other factors included a somewhat declining attendance, and a general lack of support from the city of New Haven especially the mayor. While they may be gone, and there are many people who can be blamed for their departure, the Beast left a great legacy that many people wonder what would have happened if they stayed? The Beast provided my generation with great hockey and helped to inspire generations of kids to lace up their skates and become hockey players. In my previous article (click the link) I talked about how the Beast provided the spark for their passion and love I have for sports today. I can still remember the life-long memories of going to the games with my dad and that my ultimate goal was to be a Beast player when I grew up. While only certain fragments of the Beast remain today, this is the only live action I could find click here, for my generation their legacy will live on in our memories. While the city tried once again to revive hockey with the New Haven Knights in the United Hockey League they faced many problems like the Beast. First fans were frustrated with the drop from the AHL to UHL and did not support the team like they had with the Beast of Night Hawks. Confronted with frustrated fans, falling attendance, and the same Coliseum problems confronting previous tenants, predictably the Knights didn’t last. 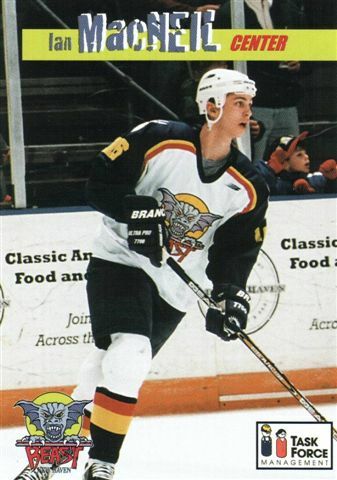 It’s been years since the Beast put on those Gargoyle jerseys and skated on the freshly polished Coliseum ice, but for me it seems just like yesterday. While they may be gone they will never be forgotten. 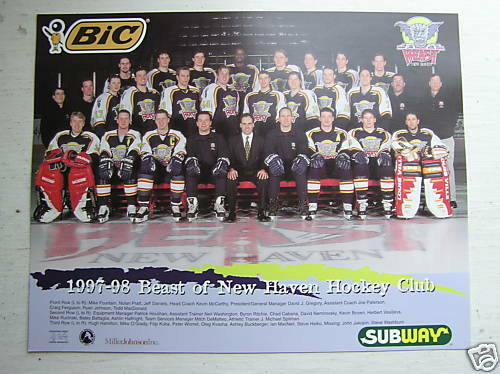 Who was your favorite New Haven hockey team? Please take our poll below! Don’t forget to subscribe and follow my blog for my weekly posts. Please comment and let me know what topic you’d like me to write about. Thanks. I miss the Beast hockey club dearly. I first came across the hockey team through my sports jersey catalog called Star Struck. After calling Connecticut’s phone information, I found out where the beast of New Haven’s Coliseum was located at. During the 1997-98 season I went to three games up there (traveling there by train from Manhattan, New York City) and had a wonderful time. I went to 1970s night. Another time I took a picture with hockey legend Willie O’Ree, and the third time I went It was skate after the game night. My friends and niece had a wonderful time that night. season. lord knows if I had the money to keep the franchise did I would have definitely did that. I hope one day the Beast would return to New Haven.